Whitehaven Saltom Pit the first undersea mine in England. IMAGINE your town is offered free gas to light up the town. Well this was the offer that shortsighted leaders of Whitehaven around 1730 rejected from one of the heroes of the early industrial revolution in Cumbria. Carlisle Spedding was our own multi-skilled equivalent of Brunel, and fully justifies his Civic Society blue plaque in Catherine Street. It was while Speddings workers were digging the seashore shaft of Whitehavens Saltom Pit that they suddenly breached a powerful blower of methane gas. Spedding, showed pioneering talent in piping the gas to the surface where it was used to illuminate the pit head complex. He even offered the spare gas to the town, but the Town Trustees turned down this chance to light the town for free!It was not until a century later in 1831 that gas lighting finally came to town. A gas works was built at Bransty at a cost of £8,000, raised in £20 shares. Two gasometers ensured town, harbour and shops and private houses were supplied with gas lighting. It was working as steward or local factor for landowning Sir James Lowther that Carlisle Spedding applied his talents. Lowther first dispatched Spedding to Newcastle to carry out under cover industrial espionage among the Geordie colliers. Upon Spedding's return, work began in 1729 on the Saltom Pit near Whitehaven, the first undersea mine in England, and, at 456 feet (139 m) deep by 1731, the deepest undersea mine anywhere at the time. The first problem to be confronted in such an enterprise was drainage, which was dealt with by using early Newcomen steam engines. Lowther had already been the first to set up a Newcomen engine in Cumberland in 1715 at the Stone Pit at Whitehaven. The second problem at the mines was the methane we already mentioned. This was called firedamp, and was to claim hundreds of lives in the Whitehaven pits. Spedding invented the "Steel Mill", a device that struck sparks from a flint to give illumination (and which was less likely than candles to ignite firedamp). He also introduced forced ventilation to try and clear the deadly gas from the deep working. But the Whitehaven pits were perpetually gassy, and the hazard of methane explosions was never entirely overcome. It was this same firedamp that in 1755 claimed Speddings own life in a pit blast. Perhaps he and his workers had too much misplaced faith in the spinning steel mill, which could in certain circumstances set off ignition. The mine at Saltom was worked until 1848. Down on the dramatic shore at Saltom are traces of the circular Gin area in which horses patiently plodded their way round and round to haul up the tubs of coal from the bottom of the shafts. Just last December work was completed on partially restoring some of the pithead ruins at Saltom and an improved footpath allows visitors to see this world heritage site. Previously the area had been fenced off because the old building were considered a dangerous structure. The buildings, which in the last 10 years have suffered from erosion and vandalism, were in imminent danger of disappearing altogether. Copeland council has worked with partners the National Trust and West Lakes Renaissance, on the Saltom scheme, and received cash help and advice from English Heritage and European funding. Evidence of the shaft, horse gin, stable, winding engine house, boiler house and chimney, cottages, cartroads and retaining walls, all survive in situ. Improvements at the site include a new information board explaining its historical significance. 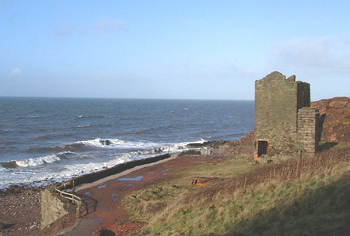 A major part of the work was the repair and strengthening of the sea wall to protect the pit head buildings. The access track down to the sea has also been improved. New oak lintels have been put into the old building to replace damaged ones, brickwork has been supported and steel ties have been put in to strengthen the walls. But the cliffs that surround the site are just as big a threat as the sea. The whole coastline is on the move and landslips have already buried two-thirds of the old pit-head buildings. At one time there was a small pier and staith in Saltom Bay to allow ships to approach for loading, one can only imagine the tricky task getting a sail powered collier brig to anchor on this exposed stretch of coast while waiting for coal to be loaded.